to enable these brands to offer enhanced product images, descriptions and variants for a more consistent brand experience across Google. Since then, thousands of brands have taken advantage of the tool to best represent their products to shoppers, to access unique analytics and insights -- and ultimately -- to improve the performance of Shopping ads featuring their products. Today, we’re excited to announce the launch of self-sign up for Manufacturer Center, which will allow even more brands to manage their product information across Google. Now, brands can set up their accounts in a matter of minutes and start submitting authoritative, detailed, and rich product information (including images, titles, descriptions, videos, and more) to help their products stand out in a crowded marketplace -- whether shoppers are looking for inspiration, to compare products, or to make a purchase. Below, we’re highlighting two recent success stories from leading brands that are investing in rich product content to best showcase their products to shoppers on Google. Johnson & Johnson, manufacturer of popular household brands such as Band-Aid, Neutrogena, and more, has been uploading rich product data to Manufacturer Center over the past year. “Google Manufacturer Center provides us as brand manufacturers, the ability to influence product experiences, drive purchase decisions, and surface high quality and accurate product information, content, and product imagery,” said Faisal Rangwala, Senior Manager of eCommerce Strategy at Johnson & Johnson. 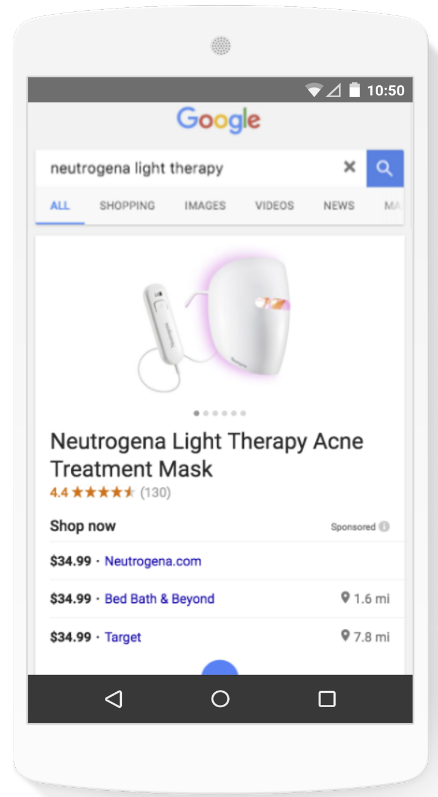 Johnson & Johnson is driving a premium search experience for products such as their light therapy acne treatment mask, by uploading more accurate and descriptive data. A 27% increase in clicks, engaging more potential customers with their retailers’ Shopping ads. International home furnishings company Safavieh submitted data to Manufacturer Center to better showcase their collections through Shopping Ads. Prior to their participation in Manufacturer Center, they relied on retail partners to submit product information to Google. As a result, they often found that their products were displayed in Google Shopping search results without the most up-to-date images, product attributes, videos or detailed descriptions. “Manufacturer Center has provided us with a great way of engaging our customers with more accurate, useful information. We can’t say enough about how being part of Google Manufacturer Center is helping to drive more traffic to our website, our retail partners’ websites, and ultimately greater sales for our products." said Arash Yaraghi, CEO at Safavieh. With Manufacturer Center, Safavieh has captured consumer attention by providing more enhanced content, so when a consumer searches for “rugs”, Safavieh can showcase multiple high-resolution zoomable images, YouTube videos, and longer descriptions. Once brands open their account, they can upload their product data directly to Manufacturer Center or work with a data partner that can streamline their product data submission to Google. A list of our approved Google Shopping data partners can be seen on our partner page. To learn more about Manufacturer Center or to sign up, visit our website. Many brands and manufacturers rely on individual retailers to showcase and sell their products; however, this can make distributing and monitoring manufacturer product information complicated, as those retailers may not always have the most accurate and up-to-date product details. 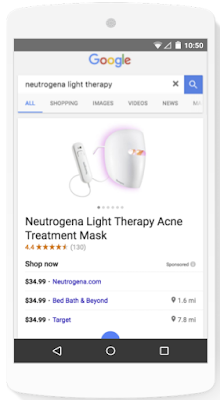 In 2015, we launched Google Manufacturer Center to enable these brands to offer enhanced product images, descriptions and variants for a more consistent brand experience across Google. Since then, thousands of brands have taken advantage of the tool to best represent their products to shoppers, to access unique analytics and insights -- and ultimately -- to improve the performance of Shopping ads featuring their products.